“Cocktail culture” is in full swing (so says any number of newspaper articles). For the most part, though, I don’t get into cocktails in our Cigar Spirits articles. I feel if booze is worth drinking, it’s usually worth drinking unadulterated. That said, one aspect of the recent cocktail boom I’m fully behind is aging cocktails in whiskey barrels. So when Top Shelf Barrels offered me a barrel to do my own cocktail aging, I figured it was worth checking out. Because I don’t have much space for a large barrel, I went with the one liter barrel (which Top Shelf Barrels engraved for me with a Stogie Guys logo). The company sells essence flavorings and has a few recipes for exotic cocktails, but I was more interested in the effects of barrel aging on classic cocktails. I quickly narrowed my options down to the old fashioned or the Manhattan. 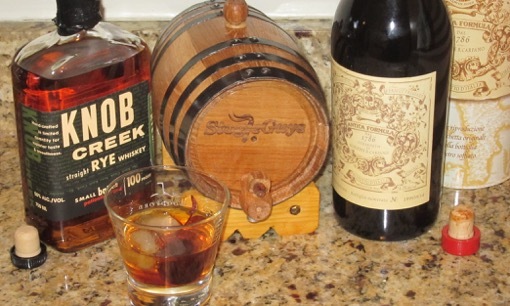 I decided on a Manhattan for my first barrel-aged cocktail experiment and went with a simple recipe: three parts Knob Creek Rye and one part Carpano Antica Formula Sweet Vermouth (my preferred vermouth). I’ll sometimes add the tiniest shake of Angostura bitters to my Manhattans, but I figured it would be easier to add bitters later, especially since all Angostura takes is a quick rinse of the glass. To judge the impact of barrel aging, I made one liter of Manhattan, poured 800 ml. into the 1 liter barrel, and then poured the rest into an extra bottle so I could taste test it side-by-side. One thing to remember about the process is the barrel may leak a little (this isn’t unusual). My barrel had the tiniest bit of seepage, which didn’t result in any puddles. After two weeks, my experiment was just right as the bright flavors were mellowed out by the wood. By the third week, the wood had overwhelmed the flavors, so be careful not to age your cocktail too long. At that point, I emptied out the barrel and poured what was left into an empty bottle so I could enjoy it, even though it had peaked a week earlier. I have to say, I was surprised by how quickly the wood impacted the Manhattan, especially since the barrel-aged cocktails I’ve had in bars were usually aged for 45-60 days. But in retrospect, this shouldn’t have been that surprising. The mini barrel has a lot of surface area for such a small amount of liquid. Ultimately, I’m deeming my experiment a success. I made a delicious barrel-aged Manhattan, and I’m looking forward to trying more experiments with my barrel. If you want to take your cocktails to the next level consider checking one out. – What kind of barrel did they send you? Was it a new, charred oak barrel? – Instead of using this for cocktails, could you use the barrel to add age to a young whiskey, rye, or scotch? – Are the barrels intended to be re-used? Or would your next adventure taste a lot like a Manhattan? -Yes this was a charred barrel, although the barrel head wasn’t charred. -You certainly could do that. I though about trying aging some young rye (or even picking up the Buffalo Trace White Dog made with their wheat mash bill that is used for Pappy and Weller) but I didn’t know how long that would take, plus having tasted whiskey aged in mini barrels, I know I prefer spirits made in full size ones. -As for reusing, that’s the idea and I see the fact that whatever I age next will pick up flavors from what was in the barrel before it as a feature. Here in the states we are used to rye and bourbon that are made with new charred casks, but for Scotch all the barrels are used (mostly sherry and bourbon casks) and then reused to age Scotch whiskey again. I might at some point put rum in to age for a while and then after that age some bourbon or rye with the hope of picking up those rum flavors, since one of my favorite ryes (Angel’s Envy) is made by finishing the rye in rum barrels. Don’t know if I could adulterate a bottle of Knob Creek Rye. It stands alone quite well. But hey, in your spare time do whatever you like!